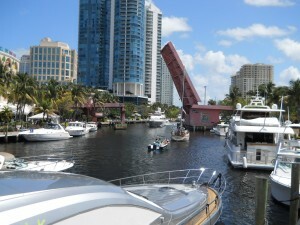 March 15th I took a 6AM flight to Ft Lauderdale and made it to the boat by 10AM. Spent two hours going through the survey list with Richard and everything had been done. Between Richard, Apex Marine and a couple of sub contractors a two page list was completed in two weeks. 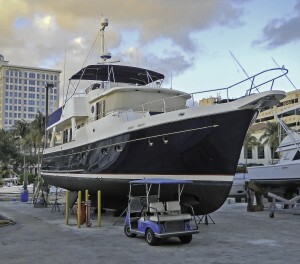 A call to Connie Crews of “All Yachts Registry” authorizing the release of the balance of the money due was all it took. Richard and I signed the closing statement and the Selene 53 “Big Smile” was ours. Cath and I had just purchased a boat 42 tons larger than any boat we had ever owned. It felt great. Acknowledgement needs to go to several people who helped along the way. First as mentioned above is Connie Crews. She handled all of the yacht registry and documentation paper work, registration of both tenders, filing the tax payments and hand delivering documents direct to the boat so that I would have them on board. She did a superb job. Richards attorney Jody Foster and our surveyor Bill Slattum were both extremely professional. Lastly, Richard and his wife Jane were a pleasure to work with and more of a pleasure to get to know. Cath and I hope to remain friends in the years ahead. I spent the next three nights living on board “on the hard” at Apex Marine. The weather was beautiful and Saturday was St Patricks day which added an exciting dimension to my long weekend. 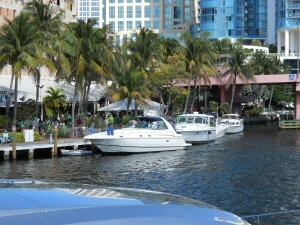 The New River was packed with boats of all sizes and many decked out in green. I spent days going through every drawer, cabinet, locker and assorted opening taking inventory and marveling at the amount of space the 53 had. I also spent time with Bill Dalton of Apex arranging some additional work. Sunday I took a cab to the airport and was back in NY by 3:30 Sunday afternoon. If all goes well we will be launching the first week in April. Have already booked our flights. Our next trip to Florida would be by car. It’s been 33 years since I last drove down and that was senior week in college. Different experience this time although the same road. We left Friday early Friday morning and made it to Santee, South Carolina by dinnertime. Up early the next day and with quick stop in Brunswick GA to check out a potential marina stop we continued on to Stuart to check out two more marinas, Loggerheads and Sunset Bay. It is likely we will spend some time at Loggerheads before heading north. 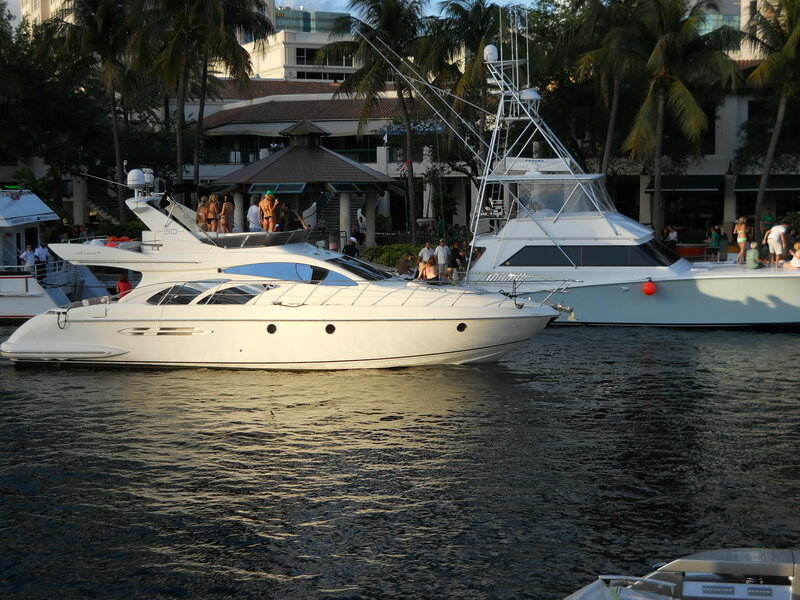 On Sunday we decided to go to the Miami boat show. 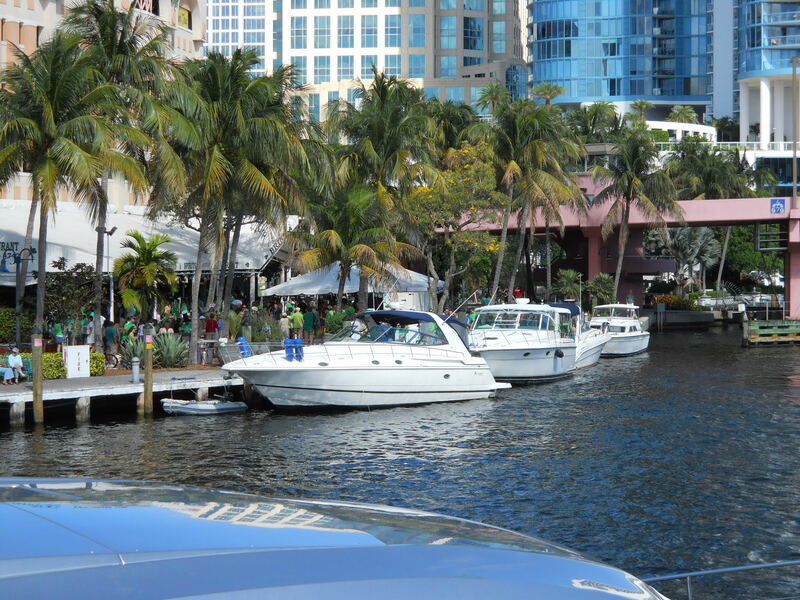 I have been to many boat shows over the years but never Miami. What an enormous venue. An exhibit hall filled with vendors and three on water venues to choose from. We took the bus to the large boat venue and there were large boats to be seen. This is a show to see at least once. Of course the purpose of our trip was to participate in the boat survey. That was scheduled for Tuesday so on Monday we got together with the owner and spent 9 hours going through the systems. The owner, Richard, is both pleasant and thorough. Later in the day we took the boat up to Apex Marina to park it for the night and be prepared for the morning haul out. Tuesday found us at the boat by 7:30 and we met with our surveyor, Bill Slattum. He had been recommended by Capt Chris whom we had met at Trawlerfest a couple of weeks earlier. Bill turned out to be a great person and a meticulous surveyor. 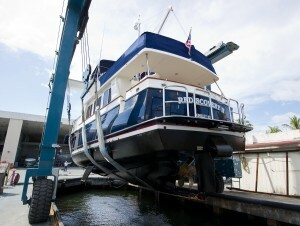 The entire process including the sea trial took just under 12 hours. The morning haul at Apex went smoothly. By 3PM we were ready to launch and start the sea trial. Apex Marine is located up the New River about 4 miles from the 17th street causeway bridge. 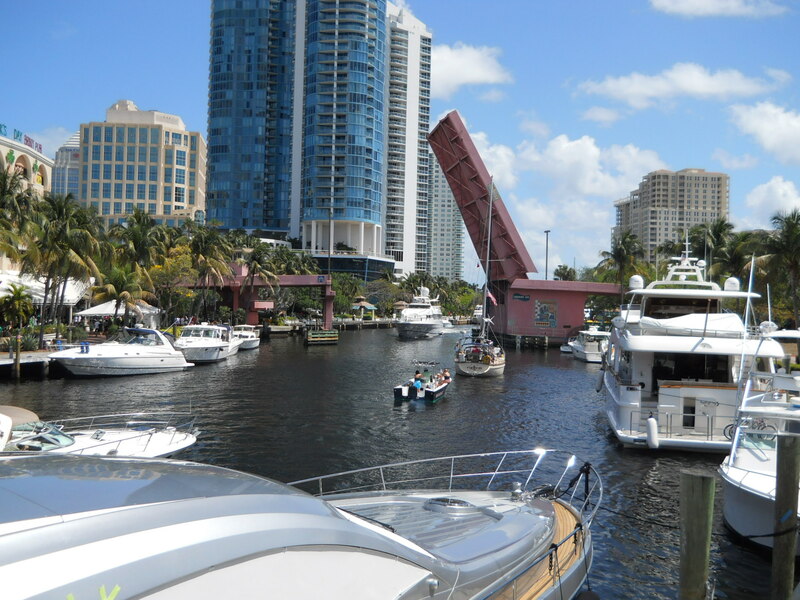 Two smaller lift bridges must be raised on the outbound journey and despite it being a Tuesday the river was busy with large yachts returning from the Miami boat show. The sea trial took us out into the Atlantic a few miles and all went smoothly till the auto pilot test. Apparently there is a previously unknown feature that activates with a double tap on the key board. That feature overrides the second autopilot thus not allowing us to shut off the course correction test and subsequently had us going in circles. To Richards credit the manual was right there and a quick read corrected the problem. By 6:30 PM we were back at the dock at Bahia Mar. It was a long and interesting day. 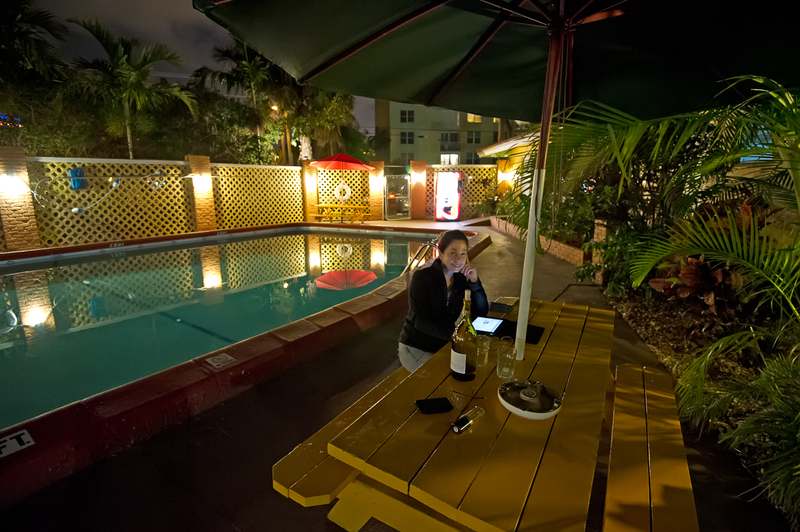 Our flight back was midday Wednesday so we said good by to Richard and headed back to the small but funky hotel Cath had found in Ft Lauderdale. 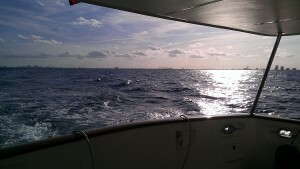 January 30th had us flying to Florida for Trawlerfest in Ft Lauderdale. 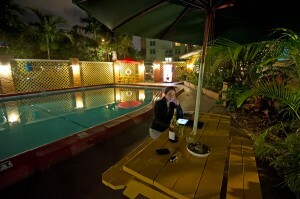 We had traded a time share and were staying in Weston Fl, 1/2 hour west of the show. On Tuesday we decide to drive all the way to Key West. I had not been there since around 1980. It was a long drive, over 300 miles each way but lots of fun. Key West, as many know is a funky town with great sites. Also some great marinas which we hope to visit some day. We were able to arrange three private showings for Wednesday. 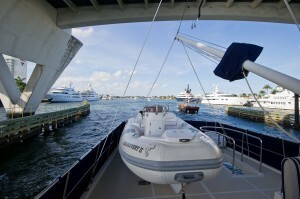 One was a private sale and the other two were with John Dennison of Outer Reef Yachts. We have known John for two years and like his style. He had given us our first ride on a Selene 53 in the fall of 2010. The boats were all Selenes. The private sale I had followed since early fall and was contacted by the owner just prior to Trawlerfest. All three boats had pluses and minuses but the private sale Selene 53 attracted us most. We have been looking for two years and had a good idea of what we wanted. This boat had almost all of our needs. 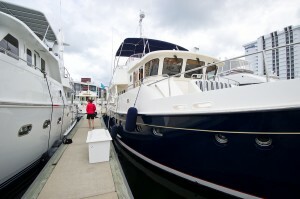 Trawlerfest covered 4 days, Thursday thru Sunday. We managed to get in a few seminars with Cath taking a seminar on diesel engines. Basic but informative. We also toured numerous boats. It always helps to have great weather for boat shows and this was no exception. For three days we talked to brokers, builders, insurance agents and also met Capt Chris and his wife. We met with Bill Harris of Kadey Krogen’s Stuart Fl office. They had the new Krogen 52 on display. I had received the plans for the Krogen 52 eighteen months earlier and loved what I saw on paper. We also thought the 48 North Sea was a great boat. After running the numbers, and a few glasses of wine we decided that buying new was too rich for us. We also thought the 48 was a little too small with only two state rooms. We really liked the layout a 52 or 53 footer provided. Throughout the show we kept thinking of the blue hull Selene 53 we toured on Wednesday. We really did love the look and thought it was the best fit of any boat we had seen in over two years. After much discussion we decided to make an offer and presented the offer to the owner on Saturday afternoon. We received a counter offer Sunday morning and both of us thought it is was fair so the deal was made. Since we were flying out Sunday afternoon we met with the owner and his wife (Richard and Jane) Sunday morning and shook hands on the deal. 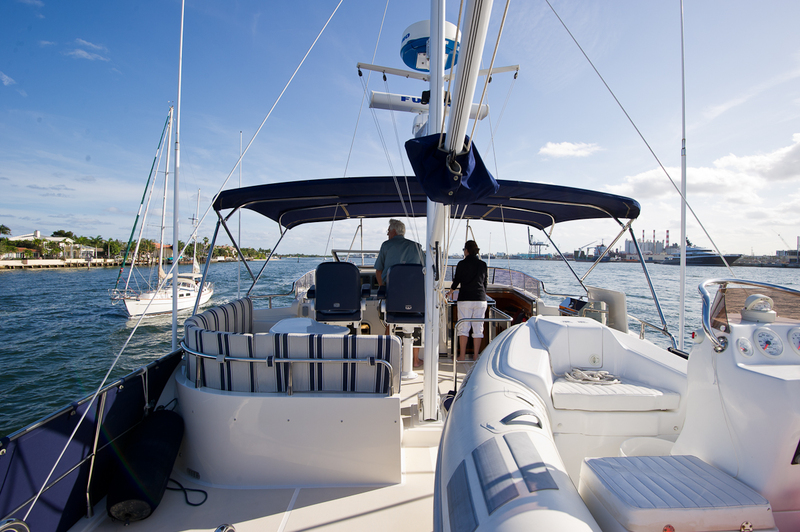 They are wonderful people and we knew the process would go as smoothly as a large boat purchase can. The whole trip was not all about boats. We had the pleasure of getting together for dinner with an old college friend and his wife in Boca Raton. They have lived in Florida for many years and have a house and boat on a canal. We also drove up to Fort Pierce and had lunch with my cousin and her husband. 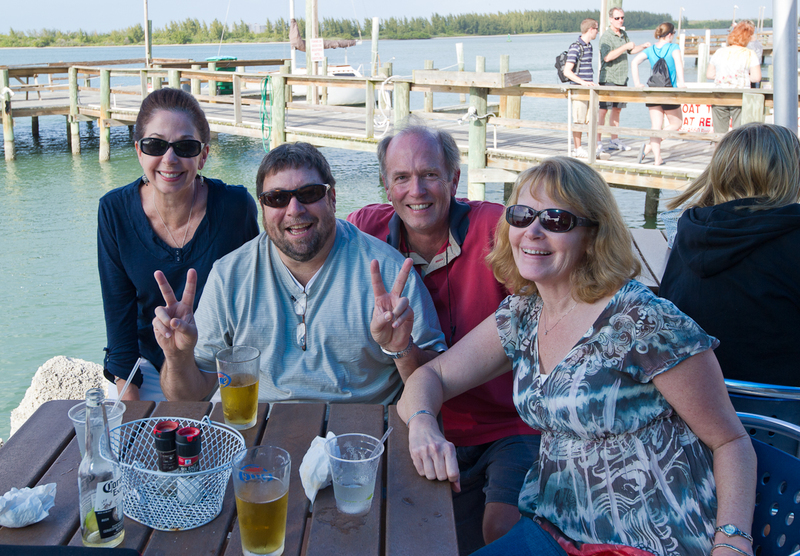 Originally from New Hampshire they moved to Florida decades ago and don’t look back. We had not been together in over fifteen years. We had a great lunch on the Ft Pierce inlet.